Places to visit to Dornod aimag. Region of Mongolia. Dornod aimag. Choibalsan. Natural History Museum. G.K.Jukov Museum. Choibalsan's Mongolian Heroes' Memorial. Wall of Chinggis Khaan. Danrag Danjalan Khiid. Dornod aimag borders on the North with the Russian Federation and on the East and South-East with the People's Republic of China. The population is predominantly Khalkha, but Buryat and Barga nationalities live in Ereentsav of Bayan Uul, Bayandun, Dashbalbar, and Tsagaan-Ovoo somons. Gurvan-zagal, and Khuluunbuir somons are populated by the Uzemchin. 4/5 of the territory is hilly. The vast steppes of Menen, Matad, and Tamsag cover the territory of 186 miles (300 km) in the East with some parts reaching 93 miles (150 km.) in width. 93-124 miles (150-200 km) along both sides of the Kherulen river lie steppes. The lowest point of Mongolia is the basin of Khukh lake 1837 feet (560 m) on the North-East part of Dornod aimag. Spectacular branches of the Khyangan mountain range at 3,280-5,250 feet (1,000-1,600 m) above sea level rise on the south-east part of the aimag's territory. Also there are high mountains along the sides of the Uuiz river, and low hills along the sides of the Onon river. The annual precipitation is 10-12 inches (250-300 mm). Onon, Kherulen, Khaikh, Uuiz are the biggest rivers. Numerous lakes could be found in Dornod, such as Khukh, Galuut, Bayan, Bulan and Buir. The Buir lake is the biggest, fresh water lake, others are salt lakes. In the territory of the aimag, there are many springs, the most famous ones being Tsagaan Khundii, Utaat Minjuur, Ereen, Tsagaan chuluut. Deer, elks, raccoon, boars, otter and white antelope's habitat is in the basins of the Onon and Ulz rivers, and Khyangan mountain range. Marmots prefer the steppe. Bears, boars, and muskrats habitat is the basin of the Onon river. Wolf and fox can be seen everywhere, and squirrel and lynx in some places. Soil is black and brown and rich in pasture grass. Basins of the rivers are quite fertile. Dornod aimag has a relatively well developed infrastructure. 81.3 percent of the total arable land, or around 10.0 million hectares are either cultivated or used as pasture. 118 square miles are under cultivation for wheat growing and around 1.5 square miles for growing vegetables. Mining, light industries, food processing and construction represent local industry. Dornod’s population is comprised of a range of ethnic groups, including Khalkh, Buriad, Barga, Uzemchin, Uriankhay, Ould and Kazakh. The province center, Choibalsan, has a population of 47,000. Ten percent of the flora registered in Mongolia grow in Dornod, along with more than 40 kinds of herbs and 10 kinds of useful plants. There are also plants with various ether oils that are indigenous to Mongolia. These herbs and plants could be used by the pharmaceutical industry to make drugs to cure respiratory and inflammatory diseases, to revitalize skin and to protect against the sun’s rays. Dornod Mongol (570,374 hectares). The region was made into a preservation area under a resolution of the State Baga Khural in 1992 with the purpose of protecting the Khyalganat ecosystem and the habitat of white antelopes. This area covers 570,300 hectares of land, including Matad, Khalkh-Gol and Erdenetsagaan soums. There are sand hills and beautiful legendary mountains in the area, as well as 153 species of flora and 26 kinds of mammals. Some rare birds, like falcons, fly through the area during their migrations. Nomrog (Numrug Preserve) (311,205 hectares). This preservation area covers 311,200 hectares of land in the woody and steppe regions of the Khyangan mountain ranges along the border. It was established in 1992 with the purpose of protecting flora and fauna, as well as the watersheds. The area is home to some rare species of reindeer, snakes, moles, otters, brown bears, wild ducks, eagles, falcons, cranes and condors. Mongol Daguur (103,016 hectares). In 1992 this region was made into a preservation area with the purpose of protecting the natural environment, the steppe, the waterways and swampy areas where flora and fauna abound, especially migrating and aquatic birds, and for conducting research. It was expanded into the joint Mongolia-Russia-China Daguur preservation area in 1994 and was included in the international network of areas for the protection of Northeast Asian cranes. The preservation area covers 103,000 hectares of land, including Chuluunkhoroot, Dashbalbar and Gurvanzagal soums. Black, white and other kinds of rare Northeast Asian cranes lay their eggs here and gather in large numbers during migrations. The Yakhi Lake National Park. This region was made into a preservation area in 1998 with the purpose of protecting the land through which white antelopes and aquatic birds pass. There are 251,388 hectares of land covering the areas near the borders of Choibalsan, Sergelen and Gurvanzagal soums that are part of this preservation area. There are numerous species of animals such as white antelopes, wolves, marmots and steppe foxes, as well as migratory and sedentary birds and magnificent landscapes featuring rocky hills, valleys and mountains. Ugtam Mountain National Park. The Ugtam Mountain region was made into a preservation area in 1993 with the purpose of protecting the natural environment and its flora and fauna. This mountain lies in Bayandun and Dashbalbar soums. Toson Khulstai National Park. Surrounding Toson Khulstai Lake, this 4700 square kilometer area in Tsagaan-Ovoo, Khulunbuir and Bayantumen soums was made into a preservation area in 1998 as the main reserve for white antelopes. There are rare herbs in the area such as prickled roses, orchids and the Siberian stipa gobica, as well as numerous plant species and rare cranes, steppe bustards and hedgehogs. Dornod is ideal for those interested in historical sightseeing. There are the ruins of the Kherlen Bar city of the Kidan period in the 11th century north of the Kherlen River in Tsagaan Ovoo soum; the wall route of Chinggis Khaan’s crossing of Bayan-Uul, Bayandun, Dashbalbar and Gurvanzagal soums; the Ikh Burkhant complex created between 1859 and 1864 which is 35km from Khalkh-Gol soum; stone figures from the Tureg period at Shonkh Tavan Tolgoi; the Khiimori Gobi in Matad soum; stone figures in Khutsuu, Naran and Sergelen soums; the ruins of freedom fighter Count Savaa in Sergelen soum; an artificial mountain created by Count Togtokhtur of Ilden Khoshuu in Tamsagbulag, Khalkh-Gol soum; the Utai Tavan Mountains; and Turtle Rock or Ger Rock, recorded in “The Secret History of the Mongols”. In Khalkh-Gol soum, there is a battlefield dating back to 1939; the Khanan statue; a statue for Yakovlev; a statue for the Mongolian border troops; the Statue complex for Victory, the commanding point of G.K. Jukov, the Commander of the Red Army Corps; the entrenchment of L. Dandar, where he was conferred with the title of Hero of Mongolia, and the place where M. Ekey was awarded the Hero of Mongolia. There are many statues in Choibalsan town, including those for H. Choibalsan, Soviet pilots, honored author Ts. Damdinsuren; Burte Ujin, poet Z. Nyamsuren, N.F. Gastello; Soviet hero General Kurilatkin; and a memorial statue at the place where Byantumen town was bombed; as well as tombs of Soviet troops. Choibalsan. Population 47,000. Elevation 747m. Named after the Khorloogiyn Choibalsan, this charmless aimag capital is easily Mongolia's largest (after the autonomous cities of Ulaanbaatar, Darkhan and Erdenet). Centuries ago, the city was a trading center and part of a caravan route across central Asia. It grew into a town in the 19th century, and now the major economic center for eastern Mongolia. The ethnic groups that reside here are the Khaikh, Buryat, Barga, and Uzemchin. Choibalsan is a poor city with the highest employment rate in Mongolia. From the ruins of many houses, it looks like Choibalsan has suffered a horrendous earthquake. In fact, the Russian buildings were abandoned after 1990 and the bricks, windows, gates and anything useable have been looted to help build new houses in the town's East. The capital is inhabited by a large number of dark-skinned people, a legacy of centuries of intermarriages between Buryats, Bargas, Uzemchins, and Chinese from Inner Mongolia. Museums & Memorials. The City Museum, in the former government house in the old part of town, is probable the best of its kind outside of Ulaanbaator. It contains some interesting paintings, fascinating old photos, some Choibalsan memorabilia and a giant bowl, made in 1861 which is large enough to boil mutton for 500 people. (The mind boggles, the stomach churns.) The aimag map marks the location of the many ruined monasteries. If you desperately miss the requisite stuffed animals in the City Museum, head for the Natural History Museum, on the West side of the square. The G.K.Jukov Museum chronicles the war with the Japanese along the Khalkhin Gol in 1939. It is in the ger suburbs, about 1,5km north-east of the Drama Theatre and 200m North of the main road. The caretaker (with the key) lives next door. Choibalsan's Mongolian Heroes' Memorial. It is a large arch with a soldier on horseback charging towards the enemy. Danrag Danjalan Khiid. According to the chief monk, this monastery was built around 1840 and was once very active. It contained three northern temples and four southern temples, but less than half the 800 monks could be accommodated at one time, so most had to pray outside. The Mongolian security forces descended on the place in 1937, destroyed all records and arrested most of the monks, none of whom has ever been heard from since. In June 1990 the monastery reopened and it now has two small temples where about 35 monks worship. Kherlen Bar Khot. Kherlen Bar Khot is the location of some small-scale ruins and a 3m-high tower from a 12th century city, once part of the ancient state of Kitan. There are also some balbals (Turkic stones believed to be grave markers) and, predictably, a Chinggis Khaan memorial of sorts: a rock called the 'Chinggis Bed', which commemorates his stay here. You can see a picture of the tower in the Choibalsan History Museum. Kherlen Bar Khot is about 90km West of Choibalsan, in the sum of Tsagaan Ovoo. It is on the main road between Choibalsan and Ondorkhaan, and is worth a look if you have your own vehicle. Wall of Chinggis Khaan. Stretching over 600km from Khentii aimag to China, and through all of Dornod, are the ruins of the Wall of Chinggis Khaan. This is not promoted by Mongolian tourist authorities because it was not built, or used, by Chinggis Khaan, but almost certainly created by the Manchu to limit (unsuccessfully) frequent raids from rampaging Mongolian hordes. Locals know it as the Chinggisiin Zam, or Chinggis' Road. You will need a guide and jeep to find what little remains from the ravages of vandals and time, though it's doubtful whether it's worth the effort. The best place to start looking is about two-thirds along the northern road from Choibalsan to the Russian border, near the village of Gurvanzagal (also known as Slimiin Bulag). Ugtam Uul. Ugtam mountain is part of the Ugtam Uul Natural Reserve (46,160 hectares), which also includes the nearby Khairkhan Uul and the ruins of some monasteries, one of which has recently reopened. The park is situated along the Ulz Gol in the north-west of the aimag, about 35km from the village of Bayandun (also known as Naranbulag). Khokh Nuur (Khukh Nuur). The lowest point in Mongolia is Khokh Nuur (Blue Lake), a medium-sized freshwater lake at 560m altitude. Other than the thrill of standing in the lowest part of the country, there isn't much to keep you here, though the lake has a subtle beauty and you could combine it with an exploration of the Wall of Chinggis Khaan. The lake is also an important migration point for birds and you can spot many waders and shore birds here. Buir Nuur. This beautiful lake is the largest in eastern Mongolia (the northern shore is actually in China). The surrounding countryside is mostly grassland, though there are a few trees. The lake has a maximum depth of 50m and, if you're equipped with the proper paraphernalia, is a good place to fish. Khalkhin Gol. The banks of the Khalkhin Gol, in the far eastern part of Dornod, are of particular interest to war historians because of the battles against the Japanese in 1939. The dry, unpolluted air ensures that most of the relics, which are just lying around, have been well preserved. Numerous war memorials line the banks of the river. 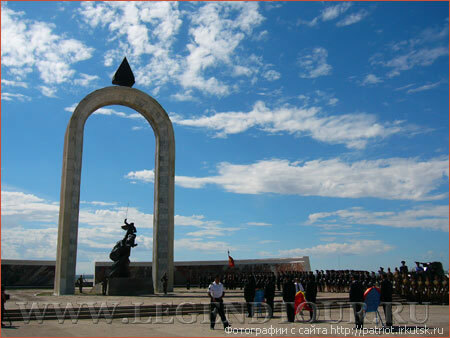 The memorials are real socialist masterpieces, built to honour the Russian and Mongolian soldiers who died here. The largest memorial is the 50m Khamar Davaa. A museum in Siimber (also known as Tsagaannuur), and a smaller one in Choibalsan, offer some explanations (in Mongolian) about the history of the battles. Another interesting site in the region is Ikh Burkhant, where there is a huge image of Janraisig (Sanskrit: Avalokitesvara) carved into the hillside. The carving was commissioned in 1864 by local regent Bat Ochiriin Togtokhtooriin, or Tovan (van means 'lord') and was reconstructed between 1995 and 1997. The map of Dornod aimag.